Paul L. Jansen and Son, Inc.
You may turn off the embedded music here. right here-- AND, at the best price. My '77 Chevy pick up is very shy and out of the picture. Jansen bench seller. Not so. We will beat them all and always have. 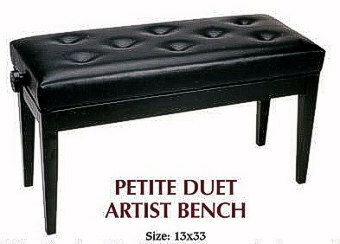 Petite Duet Bench shown at the right. Same mechanism as on the larger Duet Artist Bench. Is tufted, but not with the diamond pattern on the larger Artist Benches. comfortably play the average organ. This applies normally ONLY to Steinways made within the last fifteen years. 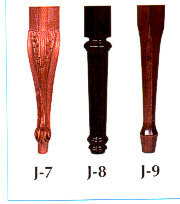 Some refinishers also use the Steinway or French rub when restoring old pianos. Be sure to talk this over with us and your technician if in doubt. This special rub is only done on conventional benches. Why so much? Jansen benches have perfectly matched legs. Special vinyl choices would also be considered. It is always fearful to apply stain and a finish to an expensive bench like this. We want you to have a way to determine if you have the stain and patina you want. to test your stains and finishes. 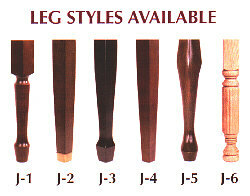 Leg Styles: See the graphic above. Finishes: Satin or Hi-Polish or "Steinway Rub"
and for the ladies, it helps solve the creeping up of the skirt. because of the freedom it gave him. This is an old world product that still finds modern uses. Brown. 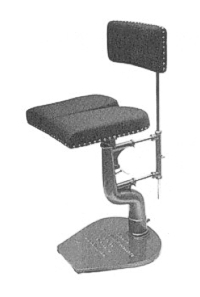 Fully adjustable to fit the musician. 125 lb weight. Upholstery samples available. Problem: The foundry wants at least 50 spoken for before they make them. I searched the world for a good bench, and all I found were flaky weak legged benches from Italy and the Orient. If you like deco rubbish, and if you weigh less that 130 lbs (60 kilos), go ahead and buy one of these spindly legged strays. But, if your bench will do hard work, you need the best world class bench. This time, "Made in USA" truly IS the best. We don't question other people's work, but when it comes to piano benches, Jansen is the best, hands down, and er.... fanny down. AND, we ship overseas. Inquire by E-Mail please. Ask our happy customers in Bermuda, Guam, and the Falkland Islands. Some special finish and color arrangements available-- ask. Choose Satin or Hi-Gloss or "Steinway Rub"
Or: Print Order form and send bank check. Jansen has agreed to "Drop Ship" to our customers in the USA. 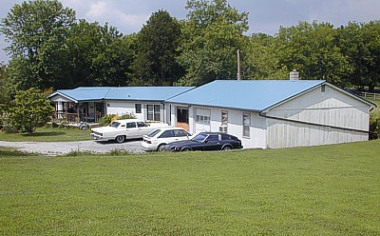 from Jansen's Factory to YOU without coming through our office. Your product will arrive sooner this way. Call us for all follow up questions concerning your order. Please DO NOT call Jansen to check on orders. and they have no records of details concerning your order. production in order to talk to you. You will not be pleased doing this. Please don't just order a bench to have a look. Check it out FIRST. Send E-Mail-- ask questions. You may want to visit a show room in your area and look at a bench. CALL: (800) 338-8863 and let's talk about your needs! We reserve the right to charge a 20% restocking fee at our discretion on all returned items. All returns of Jansen products must be returned to them. NEVER return merchandise without calling us at (800) 338-8863 to make arrangements. Let's do it right! We want to see that you receive the best results. If a product is returned damaged, Jansen will have the last word as to charges against refunds. This may be over and above the restocking fee. RETURN ALL BENCHES IN THE CARTON IN WHICH THEY CAME TO YOU. Be sure to insure all returns for the original cost of the item. arranges for UPS to come and examine the damage and return the item. and / or discard the carton, you may have to accept the product damaged. We tell you up front what other firms spring on you LATER. We hope this is helpful.